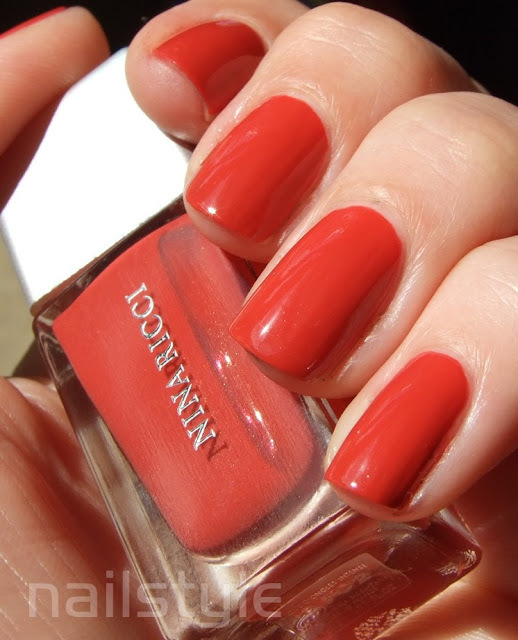 Nailstyle: Nina Ricci #30 - Coral beauty! The website I bought these polishes off says that "Nina Ricci polishes contain UV filter & vitamin E to protect nails from free radicals and they are Formaldehyde free & toluene free. Nina Ricci is a French high end brand with roots in fashion couture. The brand is ultimately renowned for representing femininity through romantic, luxurious designs and capturing the essence of a natural woman in their products." As far as application goes - this can't be beaten. Aside from the smallish brush which of course is the downside of a mini polish, the formula is outstanding. It's easy to apply and opaque in two coats and the colour pay off is really quite something else. I am in LOVE with this colour. It's very difficult to photograph the amazingness of this luscious colour and capture the subtle gold shimmer, but you can just see it in the bottle shot. So who else is familiar with this brand? I can't seem to find any other swatches anywhere . . . . in the meantime, BEHOLD . . . . I have never heard of this brand before. I really love the coral though. It's stunning!